Crying a Waterfall | Just Shooting Memories! Did any of you attend the events this last weekend for Scott Kelby’s fourth annual Worldwide Photo Walk? I did and it was huge fun. I got to meet lots of new people and explore a city which I had been to several times before, but I don’t think I really “saw” it. I attended the walk in Chattanooga and can’t wait to see where next years will take me, because there is no doubt I will do my best to make it. I have been to Chattanooga several times to visit the aquarium and surrounding area. In fact, I had made it to the north shore of the river before. However, I was amazed at the stuff I had missed on all of my previous trips. My only explanation is that I actually opened my eyes and “saw” the city. I highly recommend to anyone to start at the Tennessee Aquarium and walk around the river. There are tons of small artistic areas which were pretty cool looking. 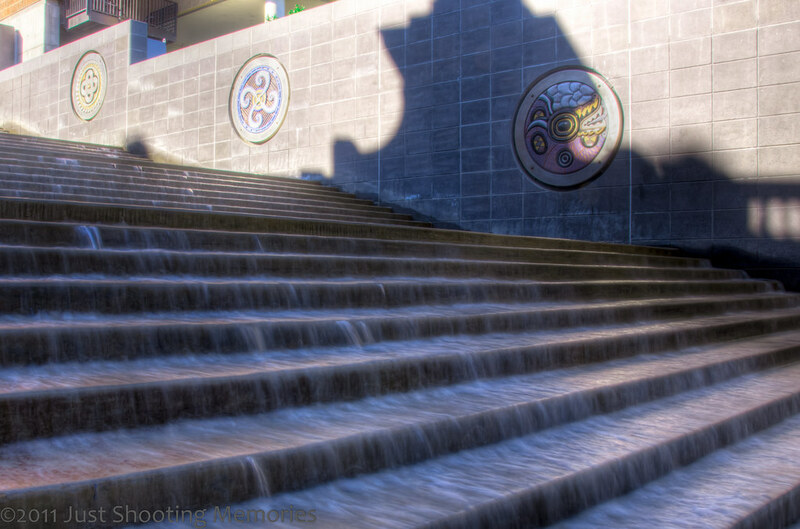 This shot is from the bottom of an artistic rendition of the Trail of Tears and was one from the photo walk. At the top are 7 fountains which empty into a small trough and the water flows into this waterfall. By the time I made it here, it was full daylight out and that made it a bear to get the settings just right for the movement in the water. I am thinking I need to invest in a good neutral density filter.